A video for "Scenes From An Italian Restaurant" that I made. The intro with wine glasses is from another fan video. I added photos, and a clip from another fan video at the end. © 2009-2010 One Final Serenade except as stated. 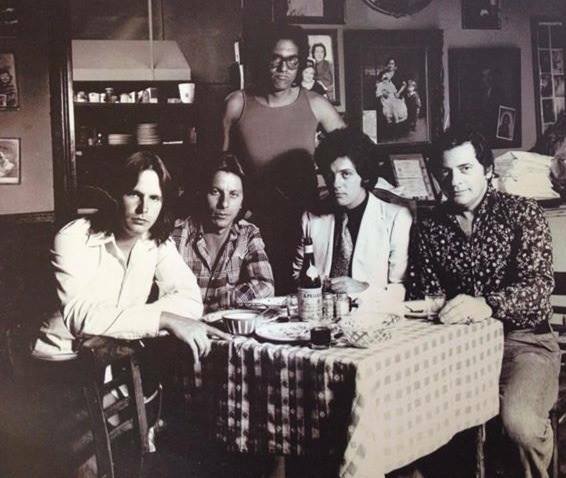 ​"Scenes" is © 1977 Sony Music Entertainment. 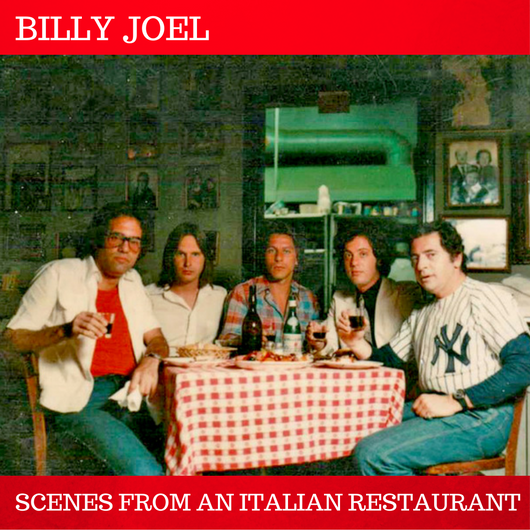 "Scenes From An Italian Restaurant" is considered by many to be Billy's masterpiece, a pop/rock suite for the ages. It is both a sweeping epic of middle class life as well as an intimate song, a glimpse into a private conversation between two old friends reminiscing about their high school days of "leather jackets and tight blue jeans" and their past hopes and aspirations. One reviewer jokingly referred to the song as a "rememberance of things pasta." Alternative back cover. 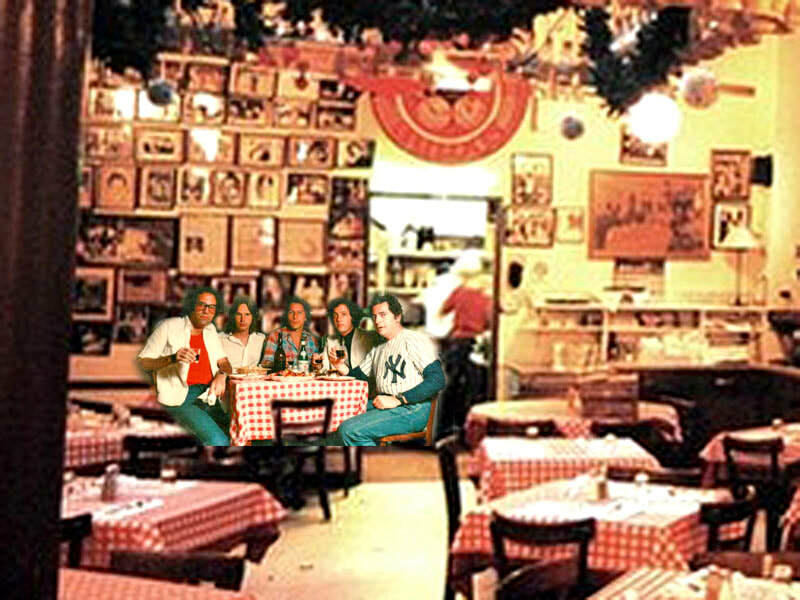 This was at an Italian restaurant in Manhattan, not the one referred to in the song. The song begins as a romantic wistful ballad, with a simple piano introduction accompanied by an accordion and then sweeping strings. A couple is meeting at an Italian restaurant but we soon discover that this is a meeting of old friends rather than a romantic couple, at least not at this moment. A beautiful saxophone solo then transports us back in time to the couple's teenage years. They reminisce about the good old days and "sweet romantic teenage nights." The line "drop a dime in the box and play a song about New Orleans" is cleverly followed by a Dixieland-like musical segue that lead us to the story about the young couple Brenda and Eddie. who once embodied the hopes and aspirations of their peers before hitting hard times as the money runs out and they divorced. It is the story of one couple, but it is also a universal story. 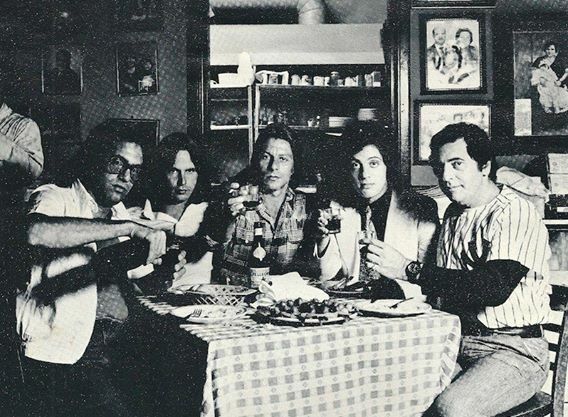 Like Brenda and Eddie and the unidentified couple at the restaurant, we begin our adult lives with high hopes, but these are often followed by dashed dreams, and then a realization that we cannot go back to the carefree days of our teenage years ("you can never go back there again"). But like Brenda and Eddie who "picked up the pieces" of their lives, we move on and eventually learn to accept and appreciate what life has to offer ("we always knew they would both find a way to get by"). We find that just surviving is a noble fight and we learn that it is the intimate moments in life, the tiny details of life like a glass of wine with an old friend and songs like "Scenes," which are most meaningful. Yet we still hang on to those memories of our youth, and to each other. Billy discusses the lyrics to "Scenes" on SiriusXM. "But you can never go back there again . . ." Photo by Art Maillet/Sony Music. 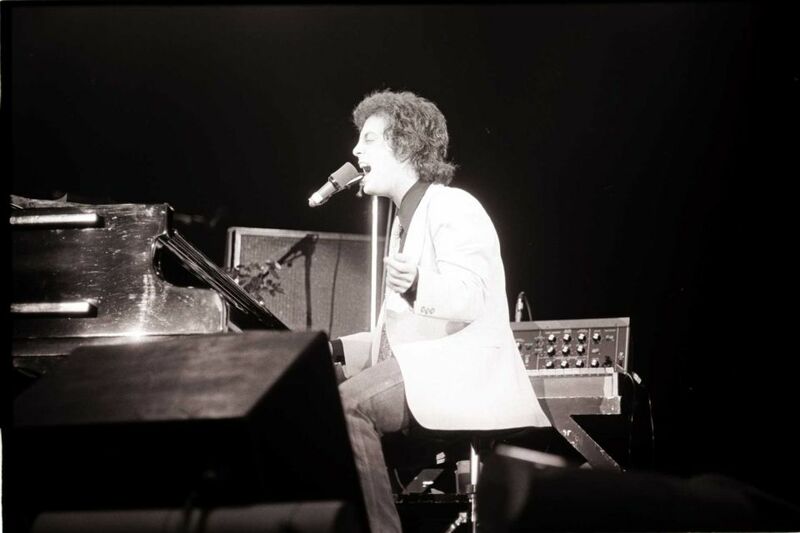 ​ Although never released as a single, "Scenes From An Italian Restaurant" has remained one of Billy's most popular, enduring, and celebrated songs. Who doesn't want to hear: "I'll meet you any time you want, in our Italian restaurant." 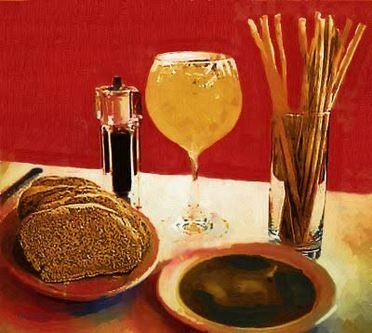 At Our Italian Restaurant by RC deWinter. This is a beautiful work. © 2012 RC deWinter. All Rights Reserved. Used with permission of the artist. Click on image for link. Billy discusses Abbey Road's influence on "Scenes," from SiriusXM. See more videos at Scenes From An Italian Restaurant - Videos Page.